In the words of Jan Tschichold, book design, "though largely forgotten today, methods and rules upon which it is impossible to improve, have been developed over centuries. To produce perfect books, these rules have to be brought back to life and applied." Richard Hendel describes book design as "an arcane subject", and refers to the need for a context to understand what that means. 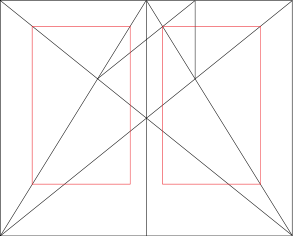 Front matter, or preliminaries ("prelims", for short), is the first section of a book, and is usually the smallest section in terms of the number of pages. The pages are numbered in lower-case Roman numerals. Each page is counted, but no folio or page number is expressed, or printed, on either display pages or blank pages. Front matter generally only appears in the first volume in a multi-volume work, although some elements (such as a table of contents or index) may appear in each volume. 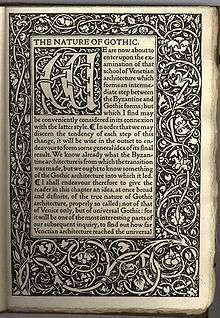 Frontispiece The author or publisher A decorative illustration on the verso facing the title page. It may be related to the book's subject, or be a portrait of the author. Dedication The author A dedication page is a page in a book that precedes the text, in which the author names the person or people for whom he/she has written the book. Epigraph The author A phrase, quotation, or poem. The epigraph may serve as a preface, as a summary, as a counter-example, or to link the work to a wider literary canon, either to invite comparison, or to enlist a conventional context. Contents Publisher This is a list of chapter headings, and nested subheadings, together with their respective page numbers. This includes all front-matter items listed below, together with chapters in the body matter and back matter. The number of levels of subheadings shown should be limited, so as to keep the contents list short, ideally one page, or possibly a double-page spread. Technical books may include a list of figures and a list of tables. Foreword Some real person, other than the author of the book. Often, a foreword will tell of some interaction between the writer of the foreword and the story or the writer of the story. A foreword to later editions of a work often explains in what respects that edition differs from previous ones. Preface The author A preface generally covers the story of how the book came into being, or how the idea for the book was developed. This is often followed by thanks and acknowledgments to people who were helpful to the author during the time of writing. Acknowledgment The author Often part of the Preface, rather than a separate section in its own right, it acknowledges those who contributed to the creation of the book. Introduction The author A beginning section which states the purpose and goals of the following writing. Prologue The narrator (or a character in the book) A prologue is an opening to a story that establishes the setting and gives background details, often some earlier story that ties into the main one, and other miscellaneous information. As such, it is generally considered part of the body in modern book organization (cf. Chicago Manual of Style). The structure of a work (and especially of its body matter) is often described hierarchically. A volume is a set of leaves that are bound together. Thus each work is either a volume, or is divided into volumes. (Single-volume works account for most of the non-academic consumer market in books.) A single volume may embody either a part of a book or the whole of a book; in some works, parts include multiple books, and in some others books include multiple parts. A chapter or section may be contained within a part and/or a book. When both chapters and sections are used in the same work, the sections are more often contained within chapters than the reverse. 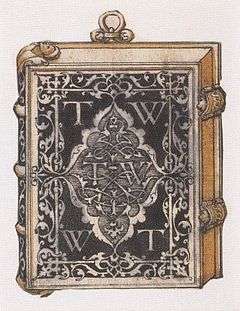 The first page of the actual text of a book is the opening page, which often incorporates special design features, such as initials. The Christian Bible (usually bound as a single volume) is divided into two "testaments" (which might more typically be described as "parts", and differ in length by a factor of three or four), each containing dozens of books, each in turn containing multiple chapters, which are most often divided (for purposes of citation) into "verses" each containing roughly one independent clause. Appendix or Addendum The author This supplemental addition to a given main work may correct errors, explain inconsistencies or otherwise detail or update the information found in the main work. Glossary The author The glossary consists of a set of definitions of words of importance to the work. They are normally alphabetized. The entries may consist of places and characters, which is common for longer works of fiction. Bibliography The author This cites other works consulted when writing the body. 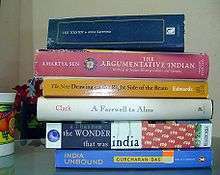 It is most common in non-fiction books or research papers. The front cover is the front of the book, and is marked appropriately, by text and/or graphics, in order to identify it as such, namely as the very beginning of the book. The front cover usually contains at least the title and/or author, with possibly an appropriate illustration. On the inside of the cover page, extending to the facing page is the front endpaper sometimes referred as FEP. The free half of the end paper is called a flyleaf. Traditionally, in hand-bound books, the endpaper was just a sheet of blank or ornamented paper physically masking and reinforcing the connection between the cover and the body of the book. In modern publishing it can be either plain, as in many text-oriented books, or variously ornamented and illustrated in books such as picture books, other children's literature, some arts and craft and hobbyist books, novelty/gift-market and coffee table books, and graphic novels. These books have an audience and traditions of their own where the graphic design and immediacy is especially important and publishing tradition and formality are less important. The spine is the vertical edge of a book as it normally stands on a bookshelf. It is customary for it to have printed text on it. In texts published and/or printed in the United States and the United Kingdom, the spine text, when vertical, runs from the top to the bottom, such that it is right side up when the book is lying flat with the front cover on top. In books from continental Europe, vertical spine text traditionally runs from the bottom up, though this convention has been changing lately. The spine usually contains all, or some, of four elements (besides decoration, if any), and in the following order: (1) author, editor, or compiler; (2) title; (3) publisher; and (4) publisher logo. A less expensive binding method is that used for paperback books (sometimes called softback or softcover). Most paperbacks are bound with paper or light cardboard, though other materials (such as plastic) are used. The covers are flexible and usually bound to the pages using glue (perfect binding). Some small paperback books are sub-classified as pocketbooks. These paperbacks are smaller than usual - small enough to barely fit into a pocket (especially the back pocket of one's trousers). However, this capacity to fit into a pocket diminishes with increasing number of pages and increasing thickness of the book. Such a book may still be designated as a pocketbook. Some books such as Bibles or dictionaries may have a thumb index to help find material quickly. Gold leaf may also be applied to the edges of the pages, so that when closed, the side, top, and bottom of the book have a golden color. On some books, a design may be printed on the edges, or marbling or a simple colour applied. Some artist's books go even further, by using fore-edge painting. Pop-up elements and fold-out pages may be used to add dimensions to the page in different ways. Children's books commonly incorporate a wide array of design features built into the fabric of the book. Die-cut techniques in the work of Eric Carle are one example. Clear or reflective surfaces, flaps, textiles and scratch-and-sniff are other possible features. The print space (German Satzspiegel) is a typographic term and determines the effective area on the paper of a book, journal or other press work. The print space is limited by the surrounding borders, or in other words the gutters outside the printed area. The German term comes originally from hot metal typesetting: above the desktop was a mirror (German: Spiegel) where the typesetter could read the inverted letters. ↑ Petroski, Henry (1999). The Book on the Bookshelf. Alfred A. Knopf Inc. ISBN 0-375-40649-2. Hendel, Richard, On Book Design. New Haven: Yale University Press, 1998. ISBN 0-300-07570-7. Hochuli, Jost, and Robin Kinross, Designing Books: Practice and Theory. London: Hyphen Press, 1996. ISBN 0-907259-08-1. Bruno, Michael H., Pocket Pal: The Handy Little Book of Graphic Arts Production. 19th Edition. Memphis, TN: International Paper, 2003. ISBN 0-88362-488-5. Lee, Marshal, Bookmaking: Editing, Design, Production. Third Edition. New York [etc. ]: W. W. Norton and Company, 2004. ISBN 0-393-73018-2. Lommen, Mathieu, The book of books: 500 years of graphic innovation. London: Thames & Hudson, 2012. ISBN 0-500-51591-3. University of Chicago Press,The Chicago Manual of Style, 15th ed. Chicago, Ill.: University of Chicago Press, 2003. ISBN 0-226-10403-6 (hardcover): ISBN 0-226-10405-2 (hardcover with CD-ROM): ISBN 0-226-10404-4 (CD-ROM).